The perfect companion to the #1 New York Times bestselling I Am Number Four series! 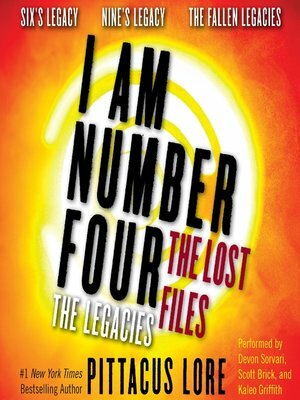 I Am Number Four: The Lost Files: The Legacies is the first collection of novellas from Pittacus Lore. Originally published separately, these stories are now together in one volume. Lost Files: #1: Six's Legacy is the captivating story of Six's harrowing capture by the Mogadorians—and her dramatic escape. Lost Files: #2: Nine's Legacy sheds new light on how Nine became the fierce and fearsome warrior he is today. Lost Files: #3: The Fallen Legacies reveals the riveting true story behind One, Two, and Three, the ill-fated members of the Garde, as told by one of soldiers sent to kill them. Before they were hunted by the Mogs, before Number Four was next, the Garde were all just teens on an alien planet called Earth—discovering their powers, trying to stay hidden, and running for their lives. And now, their Legacies are our only hope. The I Am Number Four series is perfect for fans of action-packed science fiction like the Fifth Wave series by Rick Yancey, the Maze Runner series by James Dashner, and Orson Scott Card's Ender's Game.